Stall Dry Absorbent and Deodorizer Small Animal Formiula 6 lb. Absorb moisture and odors with Stall DRY®for Small Animals. 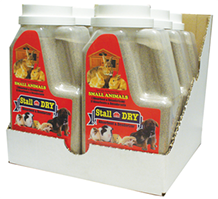 Providing the same great protection and benefits as our original Stall DRY®, Stall DRY® for Small Animals is available in a convenient plastic jug for use with small animals including rabbits, hamsters, hedgehogs, guinea pigs, gerbils, birds, cats, dogs, etc.